Koch Membrane Systems, Inc. has announced its PURON MP hollow fiber product line. This PURON MP ultrafiltration cartridge is designed for high-solids water and wastewater applications, including surface water treatment, reverse osmosis (RO) pretreatment, and tertiary wastewater treatment. PURON MP simplifies operation, eliminates clarifier pretreatment in many applications, minimizes downtime, and reduces chemical usage to provide a lower total cost of ownership. The PURON MP line fills an important niche within the KMS family of ultrafiltration membranes with an average continuous solids tolerance of up to 250 mg/L. It features an advanced cartridge design for better solids management and a virtually unbreakable reinforced hollow fiber for superior reliability. 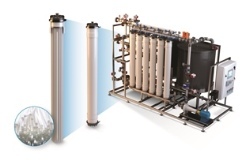 The addition of the PURON MP line allows KMS to offer a more complete range of ultrafiltration products. The PURON MP ultrafiltration system features a unique single-potting cartridge design that allows air scouring to penetrate the fiber bundle more completely and release accumulated solids to the bottom where they are easily drained away. The cartridge uses the same virtually unbreakable reinforced fiber made popular by other products in the company’s proven PURON submerged hollow fiber product line. The combination of durable reinforced hollow fibers and unique single-potted cartridge configuration makes the PURON MP cartridge an unparalleled solution for high solids water treatment. The PURON MP design finds the perfect balance between reliable, efficient performance and high quality output.